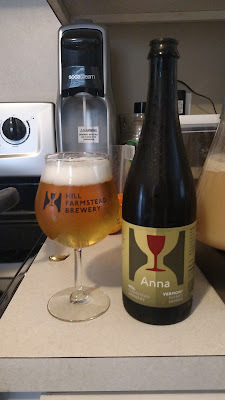 I've been working on a house Saison that I can use for a lot of things including blending and fruiting. I call it my "Kathleen" Saison. The reason for the name will come later on. This is basically a four grain Saison that has a bittering charge of hops. The target is a round bitterness but mainly create a base to give the yeasts and maybe even bacteria room to shine. I use base malt of Pale or Pilsner and any combination of specialty grains I have on hand. Usually torrified wheat, Vienna, Munich and/or flaked grains. 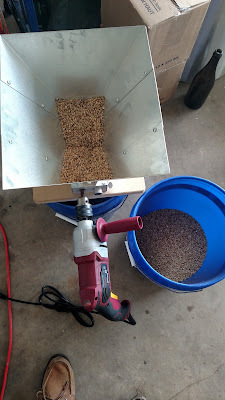 On brew day I originally had planned for 7.5# of my base malt. I pulled half a pound of it just to reduce the OG just a bit and get a little bit lower gravity. I want a beer that is easy to drink, but I'm also not going for a session beer with this one. I ran the grain through twice as last time I wasn't happy with my crush and my efficiency fell last time. Notes: Pitched my blend of 3726 and dregs of HF bottles that I had previously grown. I'm trying out a new hop in this batch as well. Aramis hops have a description of being herbal and spicy with hints of citrus. This sounded perfect for a good mild bittering charge with nice flavor additives. I wanted to give more room for the yeast to show, so I just used one addition at 30 min. One of my favorite examples of American Saison. I added the dregs of this bottle to my blend before I pitched. Had to have a Saison to drink while brewing a Saison! My pre-boil gravity was 1.048. With it being that high, I decided to only boil for 30 minutes. I'm hoping to not have any DMS off flavor by using the Pale Ale malt instead of my usual Pilsner. 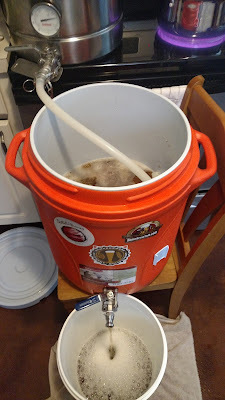 I've switched to Pale Ale malt as it's kilned slightly longer and adds just a bit more color to the brew while also allowing for a shorter boil time than my previous 90 minutes with Pilsner malt. Most of my boils from now on will be one hour. Today was a little different. I'll report back any off flavors if anything noticeable comes out. Hit a gravity (1.054) I was comfortable with after the 30 minute boil. I still think I may want to lower it even more. I'll see what the FG comes to at the end. 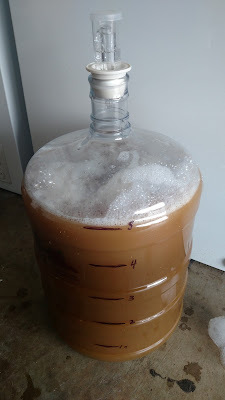 Most of my Saison brews tend to dry out fully around 1.002-1.004, so we will see. I cooled the wort to 75F and transfered to the primary fermenter. 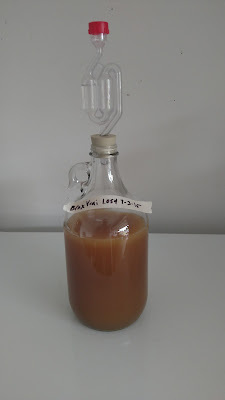 I had a little over a fourth of a gallon remaining so I decided to put it in a smaller glass carboy and pitch a vial of White Labs Brett Brux Trois Vrai. I've been meaning to grow that vial anyway. This will give a 100% Brett Vrai version of the beer. I pitched a healthy starter of my 3726 and grown up HF dregs. I kept 200ml back for blending with more Saison yeasts. This stuff has been doing work for me lately! I wanted to add some oak into the primary on this brew. Not really to impart too much oak character, but to create an inoculation vessel. I'll be able to pull the oak spiral from the fermenter and pitch it into other batches to keep the brettanomyces and other wild yeasts a home to live. Hopefully this will help impart the same characteristics to my other Saison brews if I'm happy with how this one turns out. 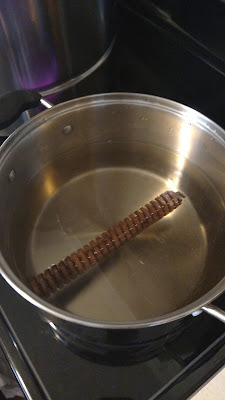 Oak spiral being boiled to reduce what flavors it may introduce. I took an American oak spiral, light toast, and boiled it for 10 minutes five times. Each time I changed the water, discarding the oak tea I had created. The last time the color of the water was only slightly tinted and the aroma had all but gone away. I don't want to impart too much oak flavor to the brew. All in all it was a pretty easy brew day. When this has fermented to dryness I'll dry hop and package. I'm hoping to keep this in a steady rotation and eventually have half on tap fresh and then bottle the other have for extended aging. 7-4-15: By 8:00AM this morning the fermenter had a 1-1.5" krausen going. Vigorous action through the airlock. 7-8-15: Krausen on the large batch had fallen down. The small brett batch has picked up a krausen and has steady bubbles through the airlock. 7-10-15: Took a sample to test the gravity. Sitting at 1.012 as of right now. Aroma is fantastic. Flavors a bit muddled but there is still tons of yeast in suspension. 7-25-15: Wow the flavors are coming on strong. This is really tasty now. I drank the entire sample I pulled. Earthy, fruity and hints of spice. Then a big of funky and even a smidge tart. Gravity is still 1.010 but there is still activity even though a lot of the yeast has fallen out. I'll set this to the side at room temp and let it dry out further! 8-1-15: I could tell most of the yeast had fallen out of suspension so I took a gravity reading. It is down to 1.004 where most of my beers tend to end up. Really tasting great. The tartness is more prevalent now. I believe I'll dry hop and bottle in the next week as long as the gravity is stable. 8-3-15: Dry hopped with 1oz of French Aramis. 8-10-15: Bottled with 4.5oz of dextrose. Gravity still showing 1.004. Tasting notes can be found here.